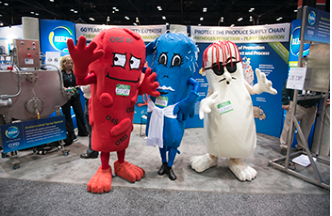 Visitors to the United Fresh 2014 produce trade show June 10-13 in Chicago had to go out of their way to avoid a trio of “nasty characters” representing foodborne pathogens. TCA designed the costumed characters, Sal Monella, E. Coli and Liz Teria, for our client Birko as a way to draw visitors to the company’s booth while promoting its food safety expertise. Sal, E. and Liz are notorious for causing chaos in food processing plants but Birko’s chemistry and equipment can successfully fight off this infamous gang. Evolving from original illustrations TCA developed for Birko, the costumed characters debuted to rave audience response at United Fresh 2014. Sal, E. and Liz were also featured at a reception sponsored by Birko, where guests could have their pictures taken with the trio.